After a long wait, we’re proud to announce the availability of jAlbum 14 – our most important update in two years. If you have an active support & update plan, this is a free update too! Here are some exciting highlights. As always you find the full list in our release notes. 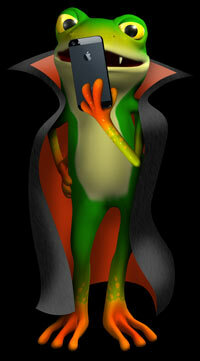 jAlbum 14 comes bundled with the brand new Tiger skin, our successor to the most used skin, Turtle. Tiger has been written from ground-up relying on modern web technologies and incorportating the most important features from both Turtle and PhotoBlogger, for instance shopping cart, tag cloud and search. It has visual similarities with Turtle to encourage Turtle users to make the move, still looking more up-to-date. It’s not just the end result that’s brand new, Tiger’s settings UI has been rewritten from scratch too in order to be more intuitive to you. To move to Tiger, just install jAlbum 14, open a Turtle album project and select “Tiger” from the skin list. jAlbum will try to match your existing Turtle settings to the equivalent Tiger settings. Most of today’s professional photo editing software use a dark user interface as this puts focus on what’s most important – your pictures. jAlbum 14 now sports a great looking dark user interface look called “Darcula”. If you happen to prefer the old look, just open Preferences and switch back to <System default>. Since jAlbum was first introduced in 2002, albums have only referred to local objects (images, videos etc), but never referring to external resources. As a web page can link to any other web page in the world, why limit web albums to local objects? Web albums are, after all, web pages. This is the idea behind jAlbum’s new object type "Web locations". Web locations are objects that can refer to any web page. This opens for some really interesting new applications for jAlbum. See for example this album collecting popular TED talks on YouTube. To add a “Web location” to your album, drop the web page onto jAlbum or select New page → Web location. A great use of this new feature will probably be to make a master album out of existing albums. Bundled skins “Minimal”, "“Base”, “PhotoBlogger”, “Turtle” and the new “Tiger” skin now supports Web Locations. 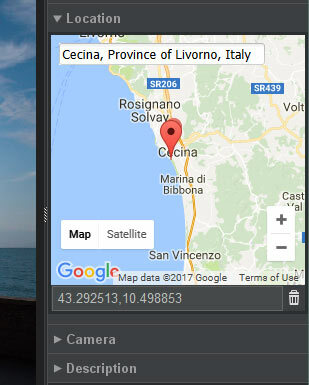 jAlbum 14 now has integrated support for geotagging images using Google Maps. Just edit an image within jAlbum and expand the new “Location” panel. Now you can either geotag that image by placing a marker on the map or view an existing location. 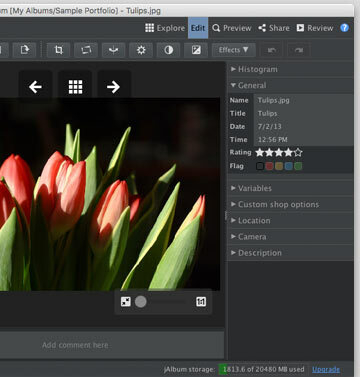 (The location data is stored within each image file in the open xmp format so it’s recognized by other xmp-aware software, like Adobe's software suite or Apple’s OS.) 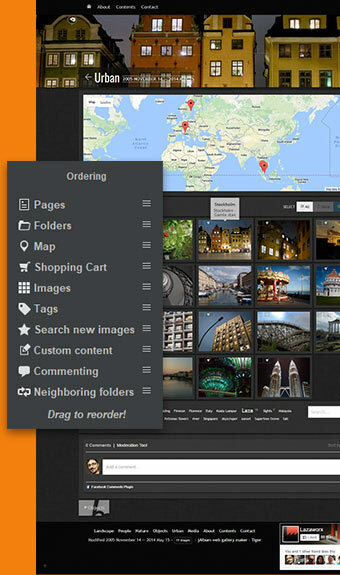 The bundled skins Turtle, Tiger and Photoblogger are capable of presenting the map location of your images. jAlbum 14 makes it more convenient than ever to protect your images. The new “Embed copyright” section under Settings → Images ensures that all images added to your album project are tagged with your copyright info once the album has been made or updated. No need to manually enter this information for newly added images anymore (under Edit → Description). Existing album projects needs to be rebuilt using “Make all” to have the new copyright information added to existing images. Note: The copyright information doesn’t affect the images themselves, it’s embedded as xmp metadata to the generated closeup image files. @Marquet, Please post about this in the Tiger section of our user forum so it reaches the Tiger skin developer. Quisiera saber si este cambio es compatible.